Since I switched Ethan to cloth diapers exclusively, I have seen tremendous improvement especially in prevention of nappy rash. Ethan has really sensitive skin and all this while he has been prone to diaper rashes. He gets it off and on, and sometimes when there is no rash, his nappy area would be slightly reddish too. In fact, there were a few times that the over-drying chemicals in a famous disposable diaper brand caused him so much discomfort that he was walking around like a crab! Hence I am very happy to note the vast improvement in his skin condition now. Not only has his nappy rash occurrences been reduced substantially, the redness has totally GONE! This is why I have been investing in cloth diapers recently, not only for now, but for the future too. And this brings me to the reason why I am so elated today. About a month ago, I ordered some cloth diapers for Ethan from Nicki’s Diapers, and I asked my manager if he would be so kind as to bring the stuff back for me in Penang. He very willingly obliged, and today my manager arrived from US and I finally got my parcel! Look! 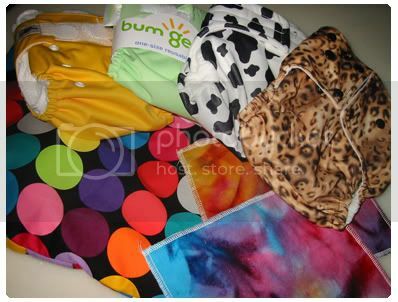 More gorgeous diapers to adorn that cute lil bum of Ethan’s. By the way, I also added a wetbag (the disco dotted one) and two cloth wipes to add to my collection. 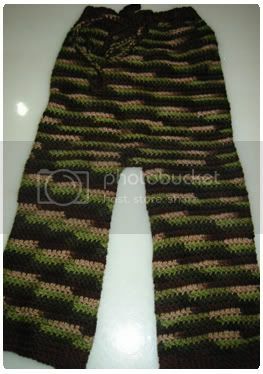 In addition, just last week, I managed to squeeze in an order for a crocheted pair of wool longies from Sweet Seats. I read that this could be used as a soaker for fitted diapers and is extremely great for heavy wetters (like Ethan). I was so eager to try them on him today, but unfortunately when I put it on him, he made a face as if to say, “What on earth is this Mommy?” You see, he has never felt wool on his skin before, hence the strange reaction. I’ll try again another day then. But they do look gorgeous, eh? And finally, as if my loot for the day was not enough, my order from Lil Danzell came today. I have wanted to get Ethan a camo print diaper for the longest time, and I have actually ordered a fitted camo one, which has yet to arrived. 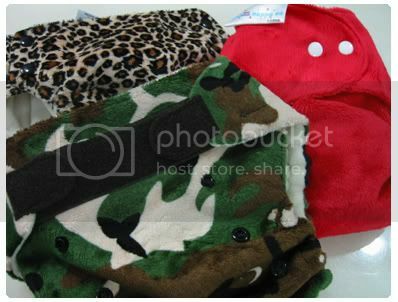 Then recently I fell in love with the Blueberry Minky diapers and as luck would have it, they had the camo green print available! I also got another Blueberry in jaguar print and an itti bitti d’lish in (Liverpool) red. These three diapers are really luxurious and feel very comfortable. They look good too, don’t they? Now, if you’ll excuse me, I need to run off and find some earplugs because Pete will be berating me on my diaper expenditure. He’s even more fashionable than aunty here. And those diapers n stuff look just fabulous! Joyce says: Ethan simply adores them! Well, sometimes he prefers to go commando, but that’s besides the point la. so lucky lil Ethan to have such a nice mummy!! He sure have lots of fashion diapers to show off. Ehh..you should be potty training him right? And the longies is so funky !! Joyce says: Yeah, I think so too! Thank you so much for your recommendations! whoa that;s a lot of diapers! Joyce says: I would say *sufficient* for now, not a lot Yes, I will be rather sad when he won’t be needing them…Strange but true…. my god… just look at the collection now! more than my son’s thomas train edi. Wow! Those are really nice!!! !